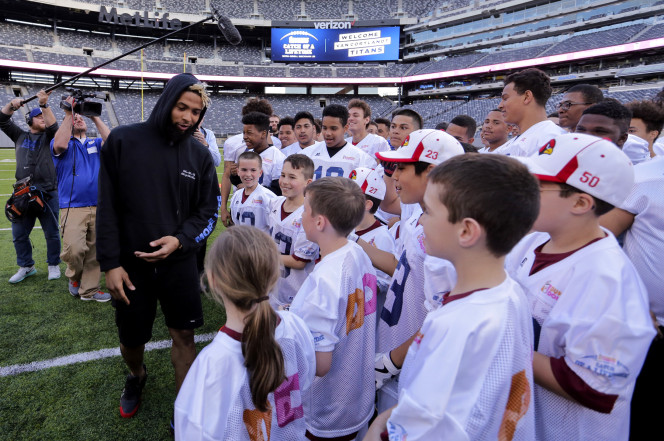 New York Giants star player, Odell Beckham Jr., was scheduled to be at MetLife Stadium yesterday from 5:30pm to 7:30pm for 50 kids at an event but showed up at 7 p.m. according to NY Post. He was paid to make the appearance for the Van Cortlandt Park Titans. Two sources tell NY Post the reason he missed his flight out of California Sunday as he attended Coachella Music Festival. The organizers of the event kept the kids busy around the stadium and Beckham showed up with no apology or explanation. Kids did get to throw a couple of passes with Beckham, take pictures and ask questions.